I grew up in a small residential town known as South Hempstead on the South Shore of Long Island. I decided to embark on this project after living away from my hometown for nearly four years, only returning for short visits. This thesis project spawned out of a sense of nostalgia as well as a desire to become reacquainted with a place I called home for over eighteen years. In photographing my neighborhood, I discovered the variety present in the streets surrounding my own, as South Hempstead is not a cookie-cutter type of suburb. I decided to specifically document the differences between neighboring houses, including the slight changes in landscaping, fencing, and architectural style. 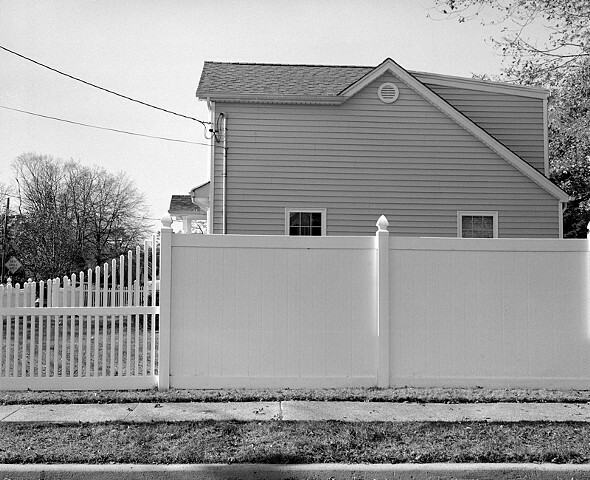 With my thesis, as with most of my other work, I focus on formal photographic qualities, such as light and shadow, for I am viewing these exteriors as works of expression put forth by the individuals within these homes. This project is not a critique of my suburban town but an attempt to point out the nuances that are typically taken for granted. I hope that my photographs convey the quaintness and slight humor I found while rediscovering my neighborhood.